Okay, okay, so I know James Thurber is a celebrated author and artist who spent the majority of his career writing for The New Yorker , but that was over 50 years ago. I really need to start washing my hands of classics such as these because they're just too old. I can appreciate his talent, but from an enjoyment standpoint I just need to stick to later, humorous biographies written by people that are still alive and dwelling in current times. Even reading Garrison Keillor 's Lake Wobegon Days is pushing it. 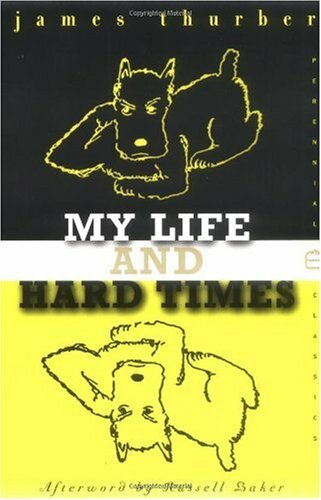 My Life and Hard Times is a very short, little book telling funny little stories from James Thurber 's childhood, teenage, and college years. I have heard these types of "when I was young we walked 20 miles up the hill to school in snow" stories BILLIONS of times, so although this book may have been original at some point in time, it definitely isn't for me. 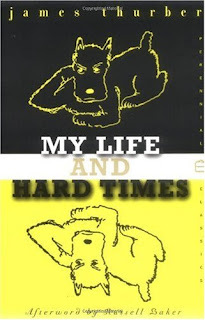 My Life and Hard Times is not terrible or poorly written, but is however fairly boring and made me sleepy. My favorite chapter is "University Days". Thurber tells of his frustration in science class trying to get the microscope to work without any luck. His rant about seeing dust particles or seeing his own eyeball is hilarious because I can totally relate! Although the book is only 106 pages long, I would definitely recommend picking up a more modern humorous biography if you're just looking for light and funny entertainment. David Sedaris is quite prolific in the humorous memoir world, and many successful comedians such as Sarah Silverman and Wanda Sykes have their own books as well.